Opposition leader Nikol Pashinyan is the man who took down Prime Minister Serzh Sarksyan, who resigned Monday after 11 straight days of mass protests. Pashinyan now says he is the only viable candidate to lead the former Soviet republic. Tens of thousands of protesters have been rallying daily in Yerevan since April 13. 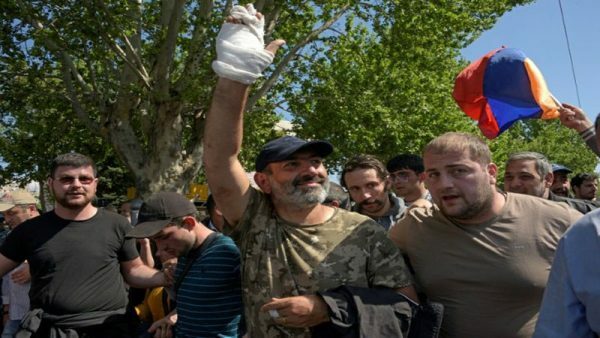 At the centre of the action stands opposition leader Nikol Pashinyan, 42, sporting a grizzled beard, dark cap and a camouflage T-shirt. He embodies hope for the many Armenians who are eager to exit the poverty that afflicts 30 percent of the population in this South Caucasus nation of 2.9 million. Pashinyan won a decisive first battle on April 23 with the surprise resignation of Prime Minister Serzh Sarksyan. After serving as president for 10 years and thus ineligible for a third term, he took up the post of prime minister earlier this month – a 2015 referendum had transferred governing powers from the presidency to the premier. The move sparked widespread protests, with Sarksyan, 63, accused of wanting to remain Armenia’s leader for life while doing little during his decade in office to reduce social inequalities. Pashinyan said Thursday he was willing to hold talks with the acting head of government, Karen Karapetyan, who rejected the offer on Friday. Pashinyan said Karapetyan was repeating Sarksyan’s mistakes and called for protests to continue. “The [ruling] Republican Party is seeking to deepen the crisis,” Pashinyan told reporters. Demonstrations are planned in two major cities on Friday and Saturday and in Yerevan on Sunday. As the former editor of an opposition newspaper, Pashinyan has occupied a special place in the Armenian political landscape. “Pashinyan differs from the majority of opposition figures in that he is daring, he’s not afraid, he’s creative, he’s got a quick wit and stamina,” sociologist Gevorg Pogosyan told AFP. Before launching protests earlier this month, he walked some 200km from Gyumri, Armenia’s second-largest city, to the capital Yerevan accompanied by supporters, often sleeping under the stars. This knack for exhibiting a certain political creativity was also seen during campaigns ahead of the last legislative elections, when he held improvised meetings in backyards or on the roofs of garages. When Pashinyan entered parliament last year with the Civil Contract party he founded, he promised to tackle both poverty and corruption. “People go to him because they are confident he’s not going to make secret deals with those in power, he won’t betray the movement,” Pogosyan said. But Pashinyan’s name is also associated with tragedy. In 2008, he was one of the leaders of a protest against Sarksyan’s victory in the presidential election. The demonstrations turned into riots, leading to a pitched battle against the police in which 10 people were killed. Pashinyan went into hiding for several months before turning himself in to the police in 2009. Sentenced to seven years in prison in January 2010, he was released in 2011 under an amnesty. “Pashinyan is the Armenian opposition today,” said analyst Alexandre Iskandarian in comments to AFP. He now aims to be “the people’s candidate” and calls for continuing anti-government protests until the ruling party “capitulates”. But he is well aware that without a mass resignation of ruling party members from parliament, he has very little chance of victory on May 1, the date set for the election of a new prime minister. Sarksyan’s Republican Party still holds 65 of 105 seats. Pashinyan is calling for the resignations of ruling party MPs and for early parliamentary elections to be held “as soon as possible”. The Kremlin has been watching recent developments in its former satellite with some apprehension. Russia still has two military bases in Armenia. In talks with acting leader Karapetyan on Thursday, President Vladimir Putin made it clear he did not want mob rule to prevail and would prefer the next prime minister to come from the ruling party, a preference that puts Moscow on a collision course with the Armenian protesters. “It was emphasised that resolving the political crisis in Armenia must take place exclusively through legal means in the framework of the current constitution,” the Kremlin said. Asked by reporters about Putin’s comment, Pashinyan called it “a misunderstanding”. “I think it’s a wrong interpretation, as Russia as well as other countries do not intervene in Armenia’s internal affairs,” he said. With protests set to continue across the country this weekend, Pashinyan has shown no signs up letting up. “If I am not elected prime minister, then Armenia will not have a prime minister at all,” Pashinyan said Thursday.